Home » 9 Things You Have To Know About Area 51! 9 Things You Have To Know About Area 51! Area 51 is, by far, the most infamous military installation throughout the whole world. And, while it technically shouldn’t exist, there are quite a well-established yet little known facts about the place. 1. It’s said that even the movements of a single fly are monitored all throughout Area 51. With motion sensors ad desert camouflage wearing security contractors known as “cammo dudes” all over, that isn’t exactly that far-fetched of a claim. 2. Before it became known as Area 51, however, it was first called “Paradise Ranch” which was then later changed to simply as “The Ranch”. The reason for this was so that employees and personnel working there wouldn’t have to make up lame excuses as to where they actually worked. 3. Back in 2013, the United States Government finally acknowledged the existence of the “mysterious” area known as Area 51. Unfortunately, the CIA claims that it’s merely just a high-tech test facility both for aerial and surveillance technology. 4. To prove this, the CIA released statements of them releasing militaryaircrafts for testing every now and then. They went on to say that the pilots would fly to all sorts of places and would then be asked to bring back cargo containing loads of lobster for the base’s canteen. 5. Area 51′s airface or R-4808 measure about 37 by 40 kilometers, which is a pretty huge strip of area if you think about it is as restricted as any airspace can get. In fact, any unauthorized pilot caught flying above or through it faces charges from court martial, to dishonorable discharge and may even spend time in prison. 6. Area 51 has its very own baseball team. And, employees there have access to a cement tennis court and their very own bowling alley. Unfortunately, those are their only forms of entertainment as even Radio Waves have a hard time making it through the mountains and TV is not allowed. 7. Area 51 sees a number of nuclear bombs tested on a regular basis. 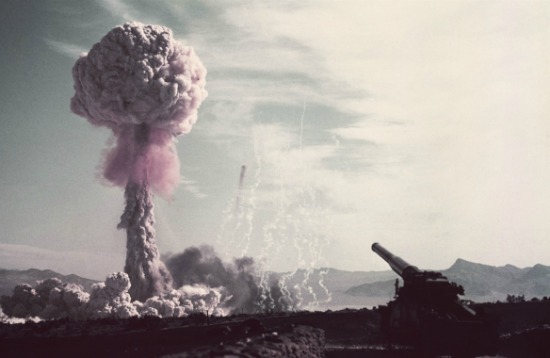 In fact, the whole place witnesssed the largest nuclear atmospheric test in continental U.S.A courtesy of the nearby Yucca flats testing site. The blast’s radius was so wide that it was said to be five times larger than that of the Hiroshima Bomb. 8. The film “Independence Day” was epic for its time. But, it was actually meant to be even more epic than it was. Set to receive the support of the U.S Military itself, the Military chose to rescind this offer because there were too many Area 51 references in the film’s script. 9. Area 51 crews once fooled the soviets and hid details of a classified plane by building decoys and replicas made out of cardboard.